Scott is a county located in the U.S. state of Kentucky. As of the 2010 census, the population was 47,173. Its county seat is Georgetown. 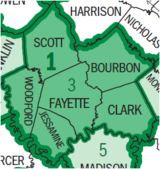 Scott County is part of the Lexington–Fayette, KY Metropolitan Statistical Area. Scott County was explored as early as 1774. One of the early settlers was John McClelland of Pennsylvania. However, the area was subjected to hostile Indian attacks, and it was abandoned by 1777. Scott County was created in 1792 from land formerly in Woodford County. It was one of the first counties created after Kentucky's statehood. The county was named for a Revolutionary War hero, Gen. Charles Scott, who commanded the Kentucky Militia at the disastrous Battle of the Wabash in 1791. Scott later took part in the 1794 victory at the Battle of Fallen Timbers, and served as Governor from 1808 to 1812. In 1825, the Choctaw Nation established the Choctaw Academy at Blue Spring in Scott County. They operated the school for Choctaw boys until 1842, when it was closed. The staff and records moved to the Choctaw Nation, Indian Territory, where the Choctaw Nation had been relocated in the 1830s. In 1844 the Spencer Academy opened as the school for Choctaw boys, while a school was also opened for girls. Later in the century, they allowed Baptist missionaries to found the Armstrong Academy there. During the American Civil War, Scott County furnished the Union Army with 118 soldiers, while about 1,000 enlisted in the Confederate Army. On November 18, 1861, Scott County native George W. Johnson was elected the provisional Confederate governor of Kentucky. Scott County is a moist county, meaning that is a dry county with a wet city (Georgetown) within it. According to the U.S. Census Bureau, the county has a total area of 285 square miles (740 km2), of which 282 square miles (730 km2) is land and 3.7 square miles (9.6 km2) (1.3%) is water. As of the census of 2000, there were 33,061 people, 12,110 households, and 8,985 families residing in the county. The population density was 116 per square mile (45 /km2). There were 12,977 housing units at an average density of 46 per square mile (18 /km2). The racial makeup of the county was 91.94% White, 5.35% Black or African American, 0.26% Native American, 0.50% Asian, 0.01% Pacific Islander, 0.82% from other races, and 1.13% from two or more races. 1.61% of the population were Hispanic or Latino of any race. There were 12,110 households out of which 38.50% had children under the age of 18 living with them, 58.80% were married couples living together, 11.50% had a female householder with no husband present, and 25.80% were non-families. 21.00% of all households were made up of individuals and 7.00% had someone living alone who was 65 years of age or older. The average household size was 2.61 and the average family size was 3.01. In the county, the population was spread out with 26.30% under the age of 18, 11.80% from 18 to 24, 32.60% from 25 to 44, 20.40% from 45 to 64, and 8.90% who were 65 years of age or older. The median age was 32 years. For every 100 females there were 95.80 males. For every 100 females age 18 and over, there were 90.70 males. The median income for a household in the county was $47,081, and the median income for a family was $54,117. Males had a median income of $40,604 versus $25,767 for females. The per capita income for the county was $21,490. About 7.30% of families and 8.80% of the population were below the poverty line, including 11.00% of those under age 18 and 12.10% of those age 65 or over. James C. C. Black - U.S. Representative from Georgia. Born in Stamping Ground. J. Campbell Cantrill - politician, U.S. Representative from Kentucky. Daniel Cook - First Attorney General of Illinois. Basil Duke - Confederate General, took part in Morgan's Raid. Brother-in-law of John Hunt Morgan. William H. Hatch - politician, U.S. Representative from Missouri. Henry P. Haun - politician, U.S. Senator from California. George W. Johnson - politician, 1st Confederate Governor of Kentucky, mortally wounded at the Battle of Shiloh. John T. Johnson - politician, U.S. Representative from Kentucky, brother of Richard M. Johnson. Richard M. Johnson - politician, Vice-President of the United States 1837–43. Tom L. Johnson - U.S. Representative from Ohio 1891–95, Mayor of Cleveland 1901–1909. John M. Palmer - Civil War general, Governor of Illinois 1869–1873, National Democratic Party presidential candidate 1896. James F. Robinson - politician, 22nd Governor of Kentucky. Was the federal governor during the Civil War. Cardome in Georgetown was his family home. John M. Robinson - politician, United States Senator from Illinois. Robert Ward Johnson - U.S. and Confederate senator from Arkansas. Nephew of Richard M. Johnson. Gustavus W. Smith - General in the Confederate Army during the Civil War, Confederate Secretary of War in 1862. Junius Ward - 19th century horseman and plantation owner, founder of Ward Hall. Edith Summers Kelley - Canadian author, wrote Weeds (1923), novel about "an artistic tomboy in the rural hills of Kentucky, who struggles unsuccessfully to overcome the oppressive roles assigned to her as a woman"
^ a b "State & County QuickFacts". United States Census Bureau. http://quickfacts.census.gov/qfd/states/21/21209.html. Retrieved August 20, 2014. ^ "Census 2000 PHC-T-4. Ranking Tables for Counties: 1990 and 2000". United States Census Bureau. http://www.census.gov/population/www/cen2000/briefs/phc-t4/tables/tab02.pdf. Retrieved April 2, 2015. ^ Ballard, Sandra (2003). Listen Here: Women Writing in Appalachia. Lexington, KY: University Press of Kentucky. pp. 320. ISBN 978-0-8131-9066-2. This page uses content from the English language Wikipedia. The original content was at Scott County, Kentucky. The list of authors can be seen in the page history. As with this Familypedia wiki, the content of Wikipedia is available under the Creative Commons License.